Karawang - Toyota Indonesia employees joined in Toyota Indonesia Adventurers Club (TIAC) together with environmental activist and Karawang, on Sunday, October 2nd 2016, to plant 1,600 Rasamala tree seedlings in Puncak Sempur, Mount Sangga Buana, Karawang city . Taking the theme "Toyota Green Camp," a tree-planting with camping activities powered by the slogan "Green Action from Green Employee" has fulfill the total number of trees that have been planted TIAC community into as many as 31,600 trees. With determination and a personal desire to preserve the nature, employees of Toyota Indonesia seeks to provide a real contribution to the city of Karawang. Although not under the Toyota Indonesia corporation's CSR activities, Toyota Indonesia management has given the full support on this positive activity. As one of the largest industrial cities in Jawa Barat, Karawang has shown significant progress. Karawang became one of the cities with the business development and into an area that is convenient for the local community. Employees of Toyota Indonesia together TIAC community, as part of Community Karawang, determined to support the comfort of the city of Karawang through environmental conservation activities such as planting Rasamala trees seed to be planted in the Puncak Sempur. With full of Green spirit, 100 participants act directly to plant trees on the site which is also a tourist area for paragliding in Karawang. This activity is purely done by the self-initiative of Toyota Indonesia employees and the member of TIAC. A total of 1,600 Rasamala tree seedlings that is use to absorb water can be planted to restore the function of Puncak Sempur that is hills and includes parts of Mount Sangga Buana. With an area of 300 hectares, Puncak Sempur have an important role as an enclave of water for residents of Karawang with a spring that flows through Cibeet and Citarum river. The existence of trees in Puncak Sempur can also be a water catchment area that keep local communities from floods. 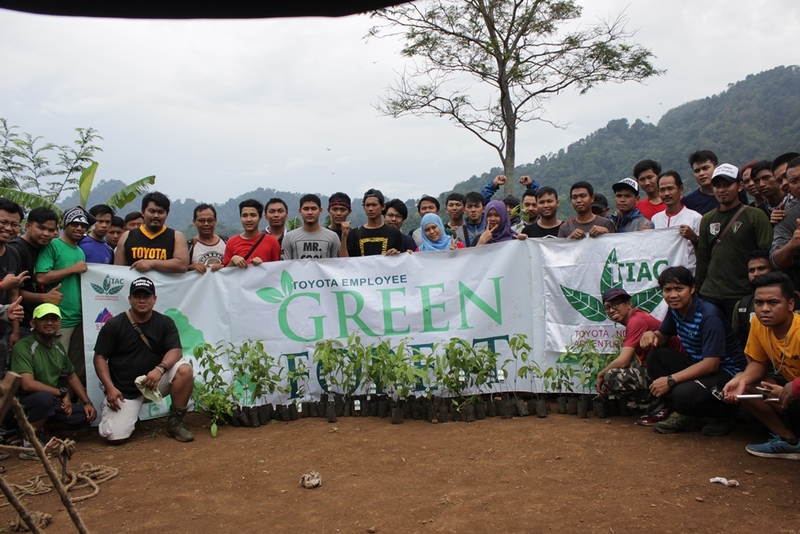 "We hope that tree planting by employees of Toyota Indonesia for maintaining natural conditions can be a real contribution and provide a positive impact to the surrounding community. Hopefully in the future, our small actions can yield great benefits for the city of Karawag, "said TIAC Chairman Chaidir Ritonga. Besides the activities that focused on the initiative of the employee, as a corporate, Toyota Indonesia is also active in environmental conservation programs in the form of tree and mangrove planting in various locations such as Jakarta, Karawang, Bogor, Sragen, Bantul, Semarang, and others. Karawang itself has planted 524,000 trees, while total planted trees reached more than 800,000 trees. "We are proud of the personal initiative of the Toyota Indonesia employees who are very concerned about the environment. Hopefully with the spirit of the "Green Action from Green Employee 'together we can realize a green earth for now and for the generations to come," said the Director of Corporate and External Relations, I Made Dana Tangkas. Toyota Indonesia has grown and developed together with the community for 45 years. Toyota is committed to grow together with the people of Indonesia in accordance with the spirit of Toyota Berbagi (Together Building Indonesia) through the provision of products and technologies that match to customer needs, being part of the development of the national automotive industry, and actively participate in social activities.